As owner and operator of H & M Fishing Charters Jules & Pat Bellanger would like to take you on a fishing trip in Grand Isle, LA. We have His & Hers Boats... If you are looking for an inland or coastal fishing Charter, then you have found the right site... H & M Fishing Charters is right for you. 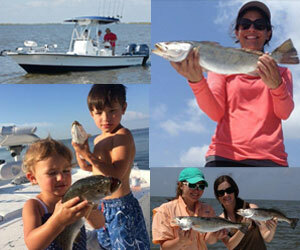 No other fishing place can offer the variety of fish caught like in Grand Isle Louisiana. We target Speckled Trout & Red Drum (Redfish), you also might catch Sheephead, Flounder, Black tip Shark, Jack Fish and/or Spanish Mackerel. We have 2 Boats available... a 24' Blazer Bay w/Twin 150HP Yamaha Engines (His) and a 24' Blazer Bay w/a 250HP Yamaha Engine (Hers). We can host one boat or multiple boats to accommodate any size group you may have with proper notice. We can hold between 2-6 people per boat. We fish the most productive waters from the Four Bayou area to Bell Pass in Fourchon and the back bays to the marsh depending on where the fish are biting. While traveling to your fishing location you can encounter nutria, porpoises, otters, ducks, turtles, white & grey herons, hawks, white and brown pelicans, sea gulls, migrating birds and other species in their natural habitat. Our sunrises and sunsets are beautiful in Grand Isle. We offer a morning trip that leaves the dock at safe light, and back around noon and we offer an afternoon trip that leaves around 3:00pm and returns before dark. Our trips include live bait, rods & reels, fuel and fishing cleaning. The customers are responsible for bringing their own beverages, food, sunglasses, sunscreen, and fishing licenses. (Don't forget your Ice Chest for the fresh catch of the day and your camera). For the out of state fisherman, a trip license is sold for a small fee at the marinas. We also offer a Bull Red trip in the the morning or afternoon depending on when the fish are biting. Children are always welcome... come to Grand Isle and experience the fishing trip you will never forget and will have memories for a long time to come. We have 45 plus years of experience between the 2 Captains. We require a deposit per boat when a trip is booked, H & M Fishing Charters has State and Coast Guard Licenses, and we are fully insured. "YA'LL COME PASS A GOOD TIME"